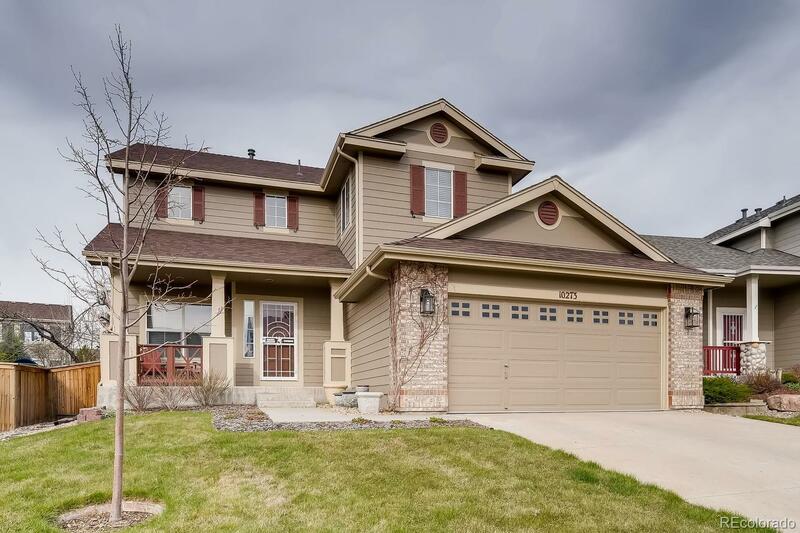 Wonderful family home in convenient location close to schools & open space. 2-story living room enjoys tons of natural light from 2 tiers of windows. Kitchen features hardwoods that extend from entry, stainless appliances that include gas range, and spacious counter tops and peninsula with breakfast bar. Kitchen opens to dining area and 2-story family room with gas fireplace and built-in shelving that’s handy for media management. Main floor bedroom also works great as a home office, workout or hobby space. Master suite has vaulted ceiling and private 5-piece bath. Upstairs secondary bedrooms are serviced by 2nd full bath. Backyard is destined to become your year-round oasis, with roomy patio, plenty of room for kids & pets, garden area & water feature, generous foliage, and Colorado sunset skies. Walk to your local schools. Just steps from trails that wind for miles through thousands of acres of open space. Community perks include 4 rec centers with pools, tennis & fitness. MUST SEE!